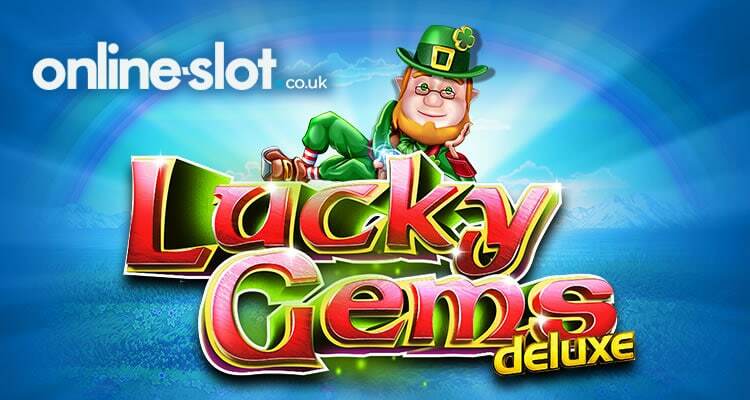 Say ‘top o’ the morning’ to a cheeky leprechaun in Lucky Gems Deluxe, a simple 5 reel, 10 payline slot from Stake Logic. The leprechaun is central to the action here. Whenever he appears, he transforms into a stacked mystery symbol. You’ll also have the option to play on 1, 2, 3 or 4 sets of reels simultaneously. Play on all devices from between 10p and £100 per spin. The cartoon style design in Lucky Gems Deluxe is simply done. In the background, you’ll see green fields, a lake, mountains and a rainbow. The plain black reels are made up of Celtic A to 10 symbols as well as blue, green and red gemstones. The red is the top paying standard symbol. It awards 8, 20 or 40 times your stake if you land 3, 4 or 5 on a payline. The Lucky Gems Deluxe logo is the wild. This can land on all 5 reels and substitute for all symbols. Land 3, 4 or 5 of these in combination and you’ll receive a payout of 10, 50 or 500 times your stake. The bearded leprechaun is the Stacked Mystery Symbol. Whenever these hit, they all transform into the same matching symbol. A new payout calculation then follows with all of the matching symbols in place. This is known as the Stacked Mystery Symbols feature. It’s possible to land the Stacked Mystery Symbol on multiple reels (either full or in part) on the same spin. They all then morph into the same symbol which can deliver some chunky combinations. That’s your lot as far as gameplay goes. There aren’t any other free spins here. The one way to spice up the action is to increase the number of reel sets in play. Click on the tab in the bottom right hand corner and you can opt to play with 1, 2, 3 or 4 machines running at the same time. This will of course set you back 1, 2, 3 or 4 times your standard stake. Like many Stake Logic slots, Lucky Gems Deluxe is a very simple game. The cartoon visuals are decent enough but the diddly dee soundtrack and shouts from the leprechaun had us reaching for the mute button. Saying that, you can win 5,000 times your stake on each spin if you fill the reels with wilds! We found this Irish yarn a little on the dull side. If you like this theme, then dive in. If not, then Lucky Gems Deluxe doesn’t offer enough on the gameplay front to win you round. I would rather play Yggdrasil Gaming’s Rainbow Ryan which offers a lot more. If you like ancient Egypt, Play ‘N Go’s Legacy of Egypt is worth playing. If you want to buy your way into the feature, Blueprint Gaming’s Vikings Unleashed MegaWays offer this option.